The Rock Band series of games is arguably the best in the genre. The first Rock Band pioneered the full band experience. The sequel brought us the disc export feature, allowing you to play previous disc-based songs using the latest and greatest game engine. The Beatles Rock Band is the best band-centric game ever. And LEGO Rock Band is far from just another easy cash grab, full of features that make it appealing to gamers of all ages. If there is one thing Rock Band does best, it is regular offerings of downloadable content. Every week, more songs are made available for players to purchase and rock out to at home. A major milestone has recently been reached: there are now 1000 songs available on the Rock Band platform. That's a mind-blowing amount, isn't it? 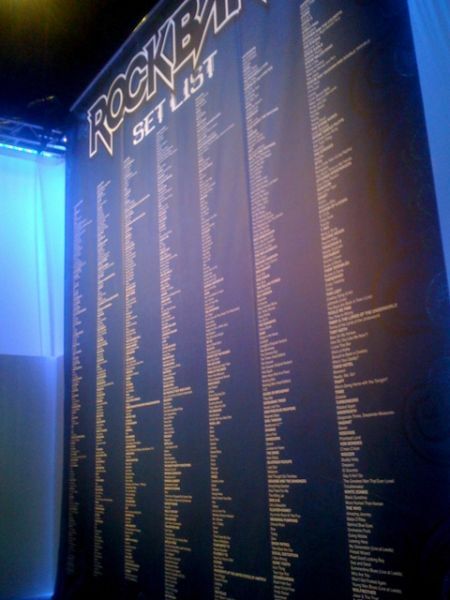 Talk about an endless set list! Best of all, the large majority of the songs, whether DLC or disc based, are compatible between the various Rock Band games. The only exceptions are The Beatles songs, unique to that game, and songs that aren't family-friendly enough to be in LEGO Rock Band. I know my hard drive contains several gigs of Rock Band DLC. How about yours? BOSTON/NEW YORK – Nov. 25, 2009 – Harmonix, the leading developer of music-based games, and MTV Games, a part of Viacom’s MTV Networks (NYSE: VIA, VIA.B), today announced that Rock Band now has more than 1,000 songs available for consumers to play within the Rock Band Music platforms for the Xbox 360® video game and entertainment system from Microsoft, PlayStation® 3 computer entertainment system and Wii™. Featuring the music of more than 390 bands, the Rock Band platform is, without question, the industry leader in providing the best selection of interactive musical content, songs and artists. “When we launched Rock Band two years ago, we made a promise to create a music gaming experience that delivered on a weekly basis more songs and artists than ever imagined,” said Alex Rigopulos, co-founder and CEO of Harmonix Music Systems. “We’re extremely proud to pass this remarkable milestone of over 1,000 songs in Rock Band and will continue to innovate and bring more of the best music to Rock Band players all over the world." "The library of great songs available to players on the Rock Band platform is vast and continues to grow," said Paul DeGooyer, Senior Vice President of Electronic Games and Music at MTV Networks Music Group. "This milestone reflects a tremendous amount of hard work from the world-class teams at Harmonix, MTV Games and at our artist, management, label and publishing partners." Rock Band delivers content in a variety of unique ways. Fans can access content included on the disc of Rock Band 2 and export other discs into their music library including Rock Band, LEGO® Rock Band, and a variety of track packs, which employ the disc export technology that Harmonix pioneered. Additionally, players can select from weekly downloadable content, now in its 105th consecutive week, all created by the dedicated Harmonix audio and art teams. To date, Rock Band fans have downloaded more than 60 million songs from the Rock Band Music Store, and coming soon, Harmonix and MTV Games will be delivering new content via the Rock Band Network, a new suite of tools that allow bands and labels of all shapes and sizes to author their songs into downloadable, playable Rock Band tracks available for sale. With more than 1,000 tracks available to date in the standard Rock Band platform, the Rock Band Network Music Store will exponentially increase the number of songs available, further securing MTV Games and Harmonix’s position as the leading provider of downloadable content for music-based video games. For a complete list of all 1,000 songs, please visit www.rockband.com/music or see the attached documents, which outline all songs to date, plus some fun Rock Band platform song stats. For more information on Rock Band, please visit www.rockband.com. Page created in 0.6223 seconds.